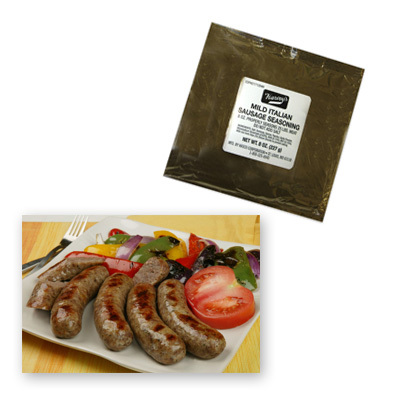 A tasty blend of spices and flavors produces a delicious mild Italian sausage. Eight ounces properly seasons 25 lbs. of meat. Do not add salt. 1 package will season 25 lbs of meat. Salt, Dextrose, Spices (including Fennel Seeds and Black Pepper), Paprika, Dehydrated Garlic, Monosodium Glutamate,(0.66%), Soybean Oil, BHA (0.15%), and not more than 2% Silicon Dioxide added to prevent caking.